Radiators can become more energy efficient when used together with one of the specially designed radiator covers from Radwraps, a news report has found. The company produces a range of covers which can be printed with designs or pictures of choice and fitted within seconds. Research by Liverpool John Moores University (LJMU) has found that a Southport company’s radiator cover is 118% more energy efficient than conventional wooden covers. For the test, the university created a domestic central heating system so tests could be conducted in specific and fair conditions. The Radwraps team wanted to get a heat comparison between radiators that were using one of their covers and a wooden alternative. Trials showed that, when using a Radwrap, the efficiency of the radiator heating system can reach up to 68%, whereas with a wooden cover it could only reach 31% for a certain water flow rate, outweighing predictions. The Radwraps radiator covers are indeed excellent solutions, and could potentially help users achieve even higher savings in terms of energy and bills by using them together with the HeatSave wireless thermostatic radiator valves. 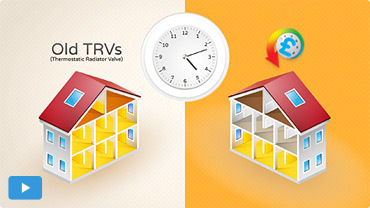 All in all, the HeatSave TRVs enable users to achieve impressive energy savings, as they will help reduce your heating bills by up to 30%, especially when coupled with the HeatingSave Building Energy Management System.